One of the beautiful things about a big city is its simple ability to give audience to the things that are happening in the wider world of the rest of the country. And so it was that I attended a book launch about an art gallery in the Northern Cape that was doing unusual and brilliant things to reach out to people across the province. 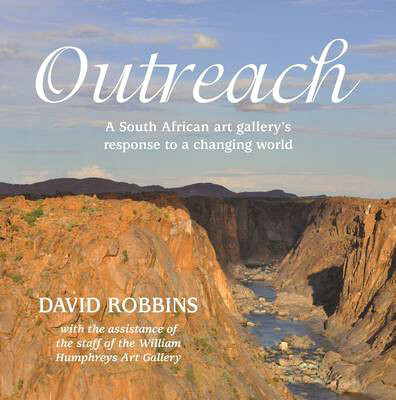 The book is Outreach, a South African art gallery’s response to a changing world, by David Robbins “with the assistance of the staff of the William Humphrey’s Art Gallery”. It was produced by Porcupine Press and showcased at the Indie Book Fair in March this year. I went because I love books. And I went because I also love meeting their authors and being among other people who love books. But this ended up being so much more — as adventures of even the smallest kind often do. It was about art and transformation, about ordinary people and yet exceptional individuals; it was a reminder of the importance of joy, and how, amid hardship we may still find the seeds of our humanity. The William Humphrey’s Art Gallery in Kimberley has taken to heart its mission to be a source of change in South Africa. Not only does it actively support local art at the heart of its collection (and I’m told it has one the highest percentages of budget spend on art acquisition of any public gallery in the country), but four times a year its staff set off on a journey around the Northern Cape to bring art, and the joy of doing art projects, to even the quietest and remotest of places. The beauty of this project is clearly revealed in the book by the photos and stories so memorably contained within. But it is all the more lovingly captured by the very personal and evocative writing style of local author David Robbins, who brings the physical and emotional texture of the experience to life so vividly. The launch evening started very poignantly with David sharing his views that art in South Africa should not by default be about relaying elite European art to a local audience (and which can be quite confounding unless one has studied European expressionism or impressionism before entering the gallery). Moreover, that art need not be about aesthetics, but is endlessly more meaningful and powerful when allowed to be about the expression of the individual. And here the audience came into contact with the unique brand of egalitarianism that the gallery and David so exemplified in their project, as they simply stated “art is for everyone, because art is in everyone”. This was more than just a mantra or a philosophy. The outreach journeys literally live out this truth. By going into schools and communities with just art supplies and encouragement, the visits give individuals an opportunity to create something — anything — that reflects a little piece of themselves. Their experiences, their thoughts and feelings, their relationship with life, or perhaps their personal message for the world. The pages of Outreach reveal this story, over and over at each stop across the Northern Cape, and with each page compounding the lesson that David and the Gallery express quite earnestly, “it’s got to do with making sense of things”. This was something I found myself instantly relating to. It is also my experience of all types of art forms, whether listening to music, reading a book, or getting lost in a movie. There’s always an element of valuing most that moment when something strikes a chord, drawing out a feeling or experience, giving it expression and identity, and at the same time a certain reassurance that one is not alone in one’s experiences and perhaps, just a human being after all. And so the project team summed up their mission, “it’s been a staggering experience. Without our central conviction of the importance of people receiving art and doing it and being stimulated by the receiving and the doing, what would be the point? Anyway, this is how we have interpreted our mission statement. Our job as the outreach team is to infiltrate the desert”. The story of Outreach is by no means told with rose-tinted glasses or with a “happily ever after” ending for all involved. The gritty reality of the lives of poverty and hardship in the places visited is laid bare, and not with much sense that a brighter or better future is necessarily on its way. David sensitises us to this in the book when he reflects on the journey at a particular point, “that was a remarkable image. The deserts of the Northern Cape lay on the surface of the image: the red dunes of the Kalahari, the massive rocks and mountains of the far west and Springbok and Okiep; but underneath lay the real important image. There existed that other desert, an internal desert of alienation and unconscious loss”. A project team member put it all the more eloquently when exhorting that “the arts can do so much for people. They are like a mirror. They can bring contemplation and understanding and a broader view”. And furthermore, that art serves “the fundamental human desire to communicate perceptions concerning ourselves and our interdependent place in the world”. Profound this may be. But it is entirely necessary for all of us to understand. To ignore what it is that we carry within ourselves impoverishes not only ourselves, but others too, who may have benefitted from the sharing. But a man much wiser than me who lived many moons ago put it much more starkly when he warned in general of life, “if you bring out what is within you, it will liberate you. If you do not bring out what is within you, it will destroy you”. Luckily, for those in the path of the gallery’s mission, an opportunity for such liberation is at least in store. My story is one of adventuring out into the urban landscape, uncovering the unusual, the eccentric and unexpected treasures that lie hidden. Most of my time is spent in the city of Johannesburg, where I live.